Two nights in Hollywood Beach kick off this cruise aboard the world’s largest cruise ship to the islands of the western Caribbean. Spend some time in Royal Caribbean’s private Haitian resort, take it slow on the shores of Jamaica and visit the Mexican island of Cozumel. After taking Saga’s included UK door-to-door travel service to the airport, fly to Miami and transfer to the 4-star Crowne Plaza Hollywood Beach (4Q) for a two-night stay. Transfer to Fort Lauderdale and embark Harmony of the SeasSM. 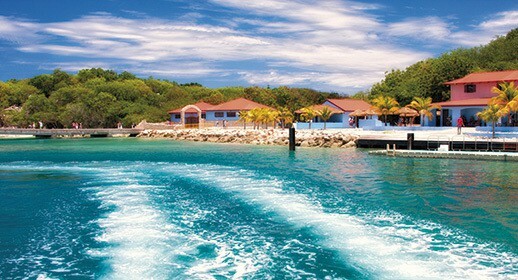 Labadee is a private resort exclusively for the use of Royal Caribbean guests. Relax in a shaded cabana, unwind on one of the many sandy beaches, peruse the Haitian market or ride the zipline down from the top of a nearby peak. This inviting town is packed with golden beaches and lush forests. Admire the Georgian structures and old colonial buildings of Market Street. This Mexican island lies off the coast of the Yucatan Peninsula and it a popular spot for diving and snorkelling. There’s also a charming town with a lively market, or you can go in search of the Mayan ruins that dot the island. Disembark after breakfast enjoy some free time in Miami Beach before transferring to the airport for your return overnight flight to the UK. Arrive back in the UK and to your included door-to-door travel service home.